Simply the Best!....Better than All the Rest! 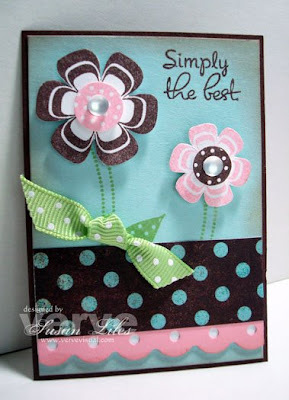 I hope you have a little fun too, and play with us in our Vervy ATC challenge! If you need a little help getting started with your ATC, check out Jen's tutorial from SCS HERE. Then HERE'S<----click! all the details about the Verve contest. Your scraps are begging to be used! TIP: Punch holes in your scalloped edges (if you don't have the Fiskars Threading Water Punch) and put a different color behind the dots for a little pop. Lovin all those polka dots! This is so super cute!! I love the layout and colors!!! I know I already mentioned this on the Verve blog but I just have to say it again...I LOVE THIS! :D Ok, I'm done. Hehe! I love working with ATC's too...although it's been a long time since I've done one. This one is adorable! Perfect colors and I love all the scallops and polka dots. I gave you an award on my blog...check it out!! C*U*T*E!!! Your colors here ROCK Susan!! Awesome possum. Love everything about it. Keep up the good work...OH, and for the record, I DO think it's the "best" LOL. *wink* You always do such great work and I admire your talent and creative eye. So, so nice. I love the colors, layout, stamps used, everything!